Standing procedure for these specialists is to prepare an applications gallery of items printed with VUTEk Printing Systems for display in the company’s trade show booth, according to Kevin Currier, worldwide applications engineering manager at VUTEk. However, a number of pressing issues had kept the application specialists from this creative task – until just two days before materials were to be shipped to the show. It was then that Currier found Mike Syverson and Rocky Lavoie, both senior application specialists at VUTEk, with their heads together in the applications lab – which “looked a lot like Santa’s workshop,” he said – creating a series of working clocks for the show. Fortunately, VUTEk is at the forefront of providing large-format inkjet printers that are capable of high-quality digital direct printing to substrates. This process allows a complicated, intricate job like the clock designs to be completed quickly, saving both time and materials. The clock components were direct printed on sheets of 3mm white Sintra® and 3mm Dibond® Brushed Silver graphic display boards by 3A Composites USA with the VUTEk PressVU 200/600 digital inkjet printer. The images were router cut with MGE i-cut digital die-cutting software. The VUTEk application specialists assembled a dozen clocks in three different designs that measured 16 inches in diameter and featured multiple layers of Sintra glued together to create a total thickness of ¾ inch and a three-dimensional effect. 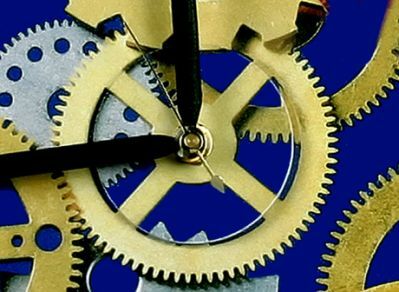 Inexpensive battery-operated mechanisms were attached to the clock backs. The clocks were set up in the VUTEk booth conference rooms at SGIA ’04. 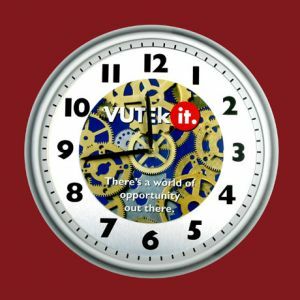 The clocks were so popular, in fact, that when sent to VUTEk’s next trade show – a sign show in Italy – the booth materials package came back without them. Dibond is a rigid, durable aluminum composite material consisting of two pre-painted sheets of .012-inch aluminum bonded to a solid polyethylene core – a unique composition that makes it approximately one-half the weight of aluminum. Dibond Brushed Silver features polyester clear-coat applied over the brushed aluminum finish. Dibond, the flattest panel on the market, offers a superior surface that protects expensive digital and screen-printed graphics. For more information about the VUTEk PressVU UV 200/600 digital inkjet printer, contact VUTEk Inc. by telephone at (603) 279-4635 or by email at info@vutek.com. Visit VUTEK on the web at www.vutek.com.